This time we’re taking a look at the music of Irish fingerstyle guitarist Colin Reid. Tickets, please! A few bits will require some practise to get your hands around, particularly the third section at bar 58. I was as much entertained by his precise and delicate guitar compositions as I was by his Ardal O’Hanlon-style banter between tunes. A great musician and entertainer, Colin Reid is one of the brightest hopes for British acoustic fingerstyle guitar in the new millennium. When Bert Jansch says that Colin reminds him of “myself and John Renbourn fused together”, you realise it’s well worth checking him out. His album, eponymously titled Colin Reid. This transcription comes from the above album. The liner notes for the tune simply say: “Ha! Ask Griz”. Not much to go on there! The tune is played with a capo at the second fret. At this point at must remind you about music played with a capo. Here we go: when reading the tab stave, all zeros (0) are played as open strings. All other numbers are the actual fret number as counted from the nut (not the capo!). 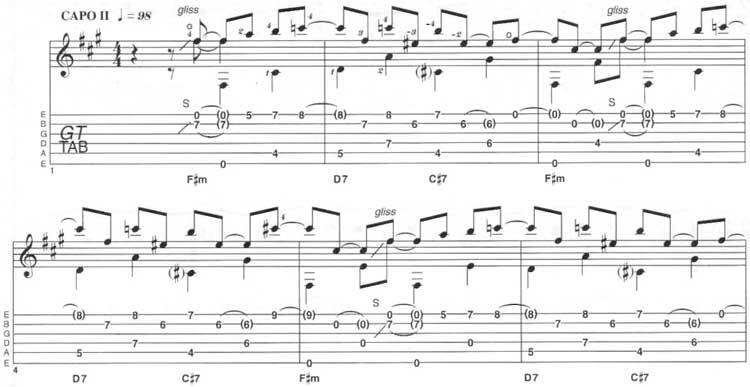 For example when a four (4) appears in the tab, the note to be played is at the fourth fret. In this piece, that would be two frets above the capo. In this system, there will be no ones or twos in the tab. The First fret after the capo is numbered three (3). The effectiveness of this system is most obvious when you are reading and playing further up the neck. In these higher positions, most guitarists take their position cues from the seventh and twelfth frets. The standard notation shows the actual pitches produced. While it does differ from other publishers, we believe that our approach is rather more logical, but I know that some of you will continue to disagree! On with the music! The tune has a bluesy folky feel to it, with hints of Anji’ appearing here and there. However, it’s far more intricate than that. After a slow intro, Colin introduces the First theme at bar 9, with an alternating bass line (root and flat seventh rather that the more usual root and fifth) and a syncopated melody on top. The double-stops in bar 12 shouldn’t be too difficult. Colin Reid ends a number of the sections in ‘Griz’s Golden Ticket’ with a descending blues run (such as the ones in bars 15-16 and 23-24). A new theme appears at bar 25 with some secondary dominants thrown in for harmonic colour. He repeats the first and second themes again and, after another two-bar blues run, he introduces another theme at bar 58. With the harmonic and melodic content of the first theme, Colin introduces a new rhythmic figure. This section is probably the trickiest part of the piece, but once you master the left and right hand techniques it should come together quite easily. First you play the bass note with your right hand thumb, then hammer a double-stop with your left hand. This double-stop is played immediately after by the right hand. The rhythm is triplet eighth notes, and the effect is ‘ Duh-uh-uh Duh-uh-uh and so on. The bass line is still alternating, and the double-stop is moved back and forth in chromatic semitones. All of this harmonic, melodic and rhythmic movement is deceptive, making the section sound faster than it actually is. After a short repeat of the First and second themes, Colin Reid introduces the Final section at bar 82: a descending series of pull-offs on the top E string over the steady alternating bass line. After a quick re-cap of some of the earlier sections, Colin brings the whole piece to a close with a crash in the final bar. The beauty of the piece is the connection between the sections and the variety Colin creates with a relatively small amount of musical matter. I hope you enjoy the piece! It’s a part of Colin Reid Griz’s Golden Ticket guitar tab and sheet. © 2012 - 2019 TabsClub Powered by TabsClub 42 queries in 0.273 seconds.